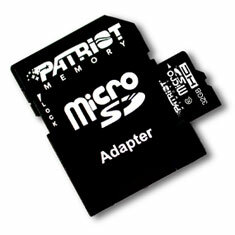 The Patriot LX Class 10 MicroSDHC flash memory cards offer blazing performance for mobile devices. The LX Class 10 MicroSDHC memory cards meet the latest SD Association specifications and provide a minimum sustained write speed of 10MB/s. Fast enough to record High Definition video, Patriot's LX Class 10 MicroSDHC cards keep up with the most demanding hardware.